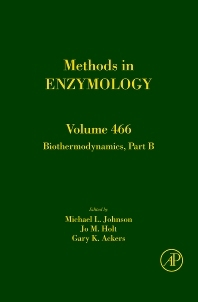 The use of thermodynamics in biological research can be equated to an energy book-keeping system. While the structure and function of a molecule is important, it is equally important to know what drives the energy force. These methods look to answer: What are the sources of energy that drive the function? Which of the pathways are of biological significance? As the base of macromolecular structures continues to expand through powerful techniques of molecular biology, such as X-ray crystal data and spectroscopy methods, the importance of tested and reliable methods for answering these questions will continue to expand as well. This volume presents sophisticated methods for estimating the thermodynamic parameters of specific protein-protein, protein-DNA and small molecule interactions.